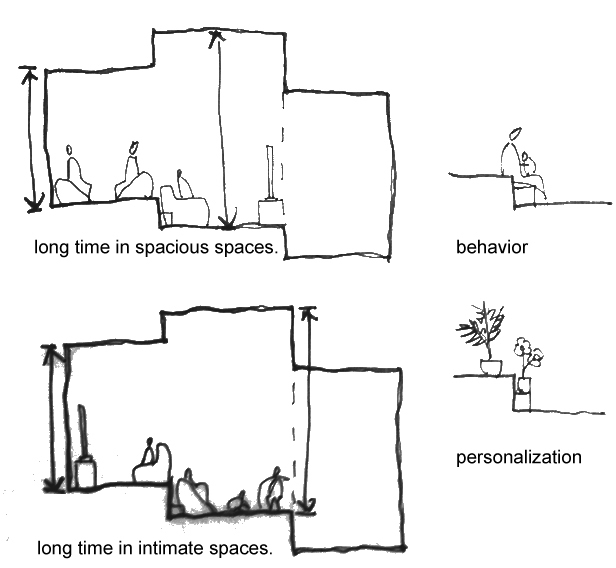 User-participation and flexibility has been overly mentioned typically in the context of social-housing and office project where user is argued to be a central of concern in architectural design either during design process, post-completion of project and future development of building by user on his own, especially back in the movement of structuralism, Architects like Lucien Kroll, Herman Hertzberger and John Habraken. Many ideas has been developed through time, like open-plan, user as designer, user as contractor, user as developer and so on to achieve the essential idea of flexibility and participation. 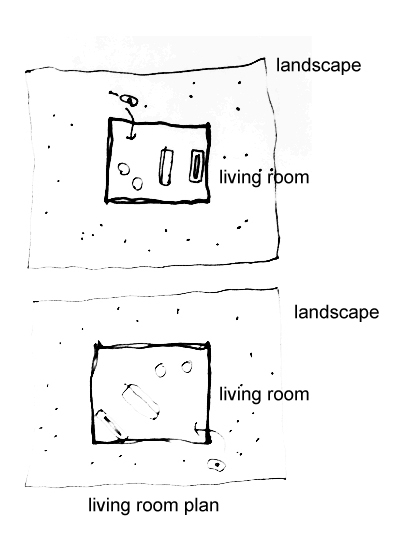 However, most of the ideas intersect with political dimension and contradiction within architects role. In this assignment, Architecture is defined as construction, form with purposes while a totally opened plan is conceived as abdication of role of architect towards user. 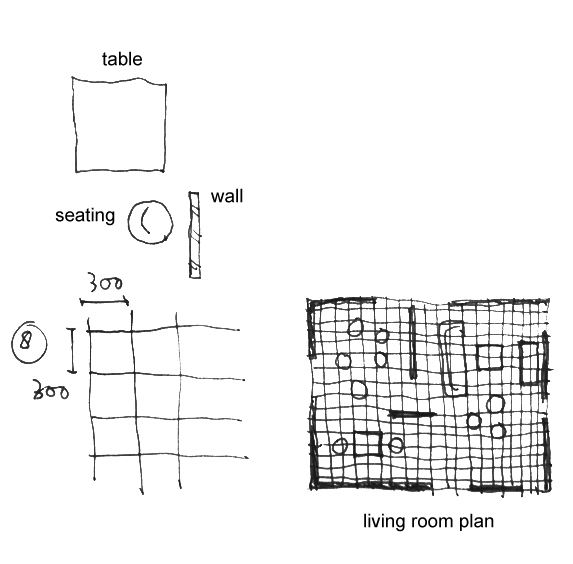 Last but not least the 10 strategies of living room design will demonstrate architectural concept in achieving user participation and flexibility. A research has been conducted to survey important attributes of user in living room via Mean-End Chain method to investigate attributes, consequences and value. 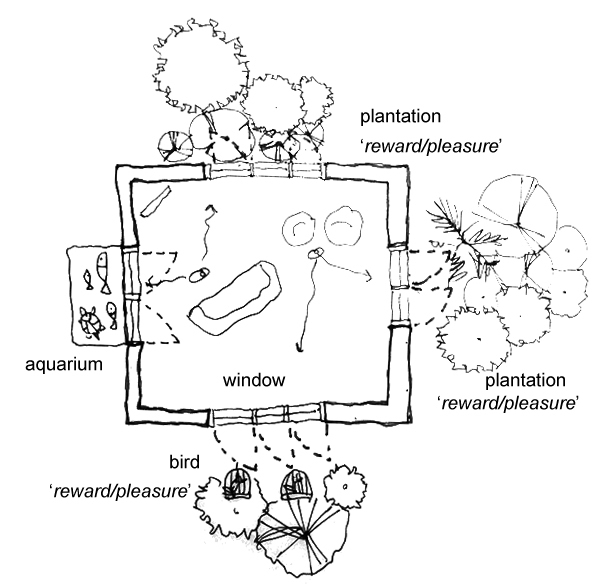 The outcome reinforces concept of user participation and flexibility through architecture. 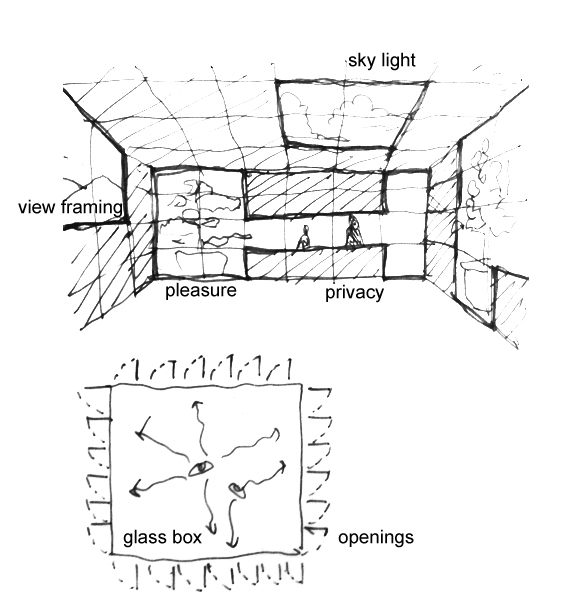 The idea utilized hedonistic attributes based on MEC research outcome(varies individually) as catalyst for user to participate in controlling their environment via window openings. One way to encourage passive strategy to achieve user-environment participation is to allow user to obtain ‘reward’ when they actually opens a window for not only air, lights, but pleasure. With a configuration of 1 circulation spaces and 3 generic spaces of similar sizes, allows high flexibility of positioning living room, bed room, and kitchen on own preference of user over time. The interchangeability provided by the layout has high flexibility to adapt to changes through time in responses to outdoor view, neighbour, internal privacy issue, baby sitting and number of family members. Intimacy, openness, spaciousness, in this case is characterized by ceiling height and volume of living room. 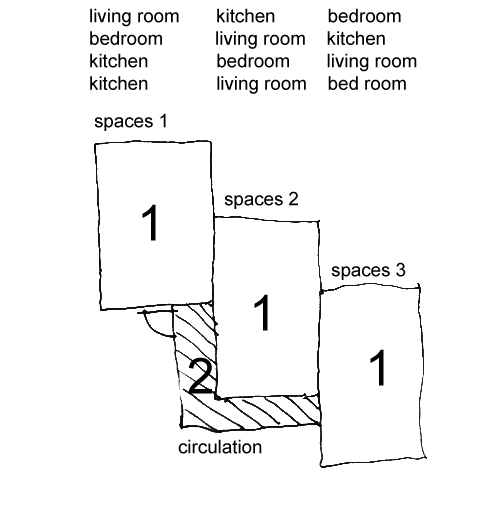 Living room with pocket of spaces in various height allow user to decide his activity and furniture planning, which leads to user-environment participation. The few steps drop in between is ambiguous where it allow various behavior and personalization to take place, supported by MEC outcome. 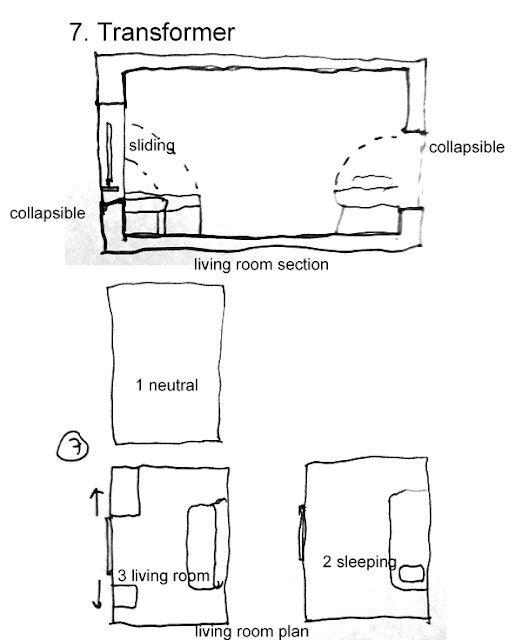 Position of structural column in this case allow creative planning, social circumstances to take place in living room. 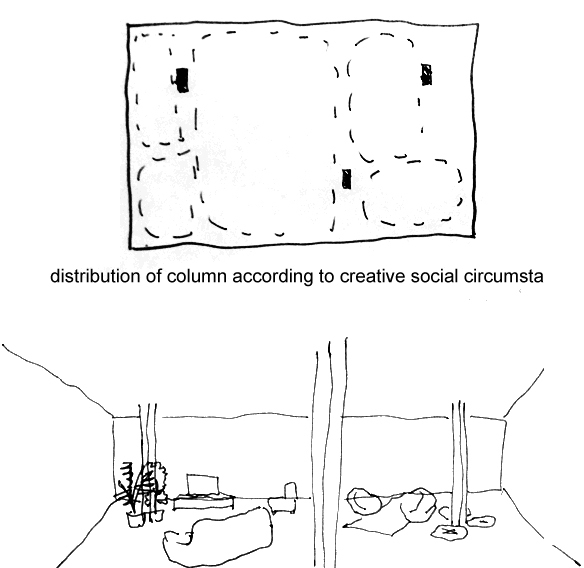 Column provided traces or clue for user to participate in their living room environment by planning according to their own preference, within constrain for higher creativity, rather than a total open plan where user might not know what to do about it. 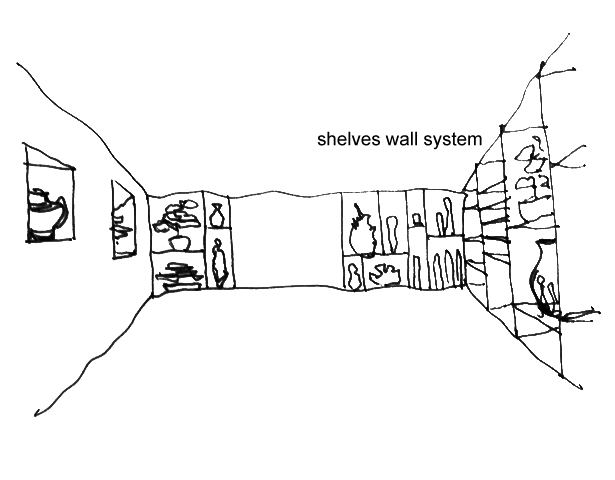 The wall of a living can be designed as a shelves system to allow high personalization tendency. Especially for user who likes Bonsai, antique, and crystal, the idea caters for user to participate their own living room by achieving conformity and hedonistic value according to MEC outcome. With movable partition technology, living room is allowed to either position in a smaller spaces, bigger spaces, or a combination of both into maximum spaces. In super high density country like hong kong and japan, a typical tiny living unit may adopt idea of transformable spaces, while user participate by making easy decision and fixed and changes to their environment according to time and activity. Standardization of dimension of component of living room into a based 300 mm value makes planning and changes easy and flexible. 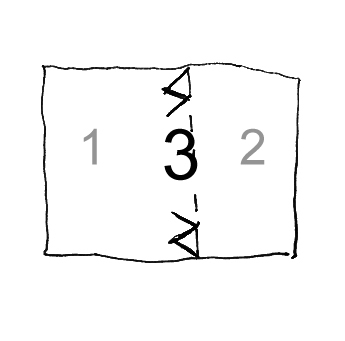 In this case, entrance governs position of living room. Therefore, a neutral position of living room at central of plane where entrance can be anywhere provides high flexibility for internal planning.